Service Costs > How Much Does Graffiti Removal Cost? How Much Does Graffiti Removal Cost? Graffiti has always been a topic of controversy. While some people view it as a work of art, other people think of it as an eyesore. Graffiti has always been part of the societal fabric in larger cities. Some are even considered street art; however, most of the graffiti we see, especially today, do not reflect any aesthetic value at all. Rather than a work of art, the graffiti is simply scribbles. The reason many people are against graffiti is that it is usually done on public buildings or private property and is, therefore, considered to be vandalism. The removal of graffiti is the responsibility of the government if it is a public building or of the property owner if it is a private building or home. Either way, this service is going to cost you since it can be labor intensive work. The costs to remove graffiti will depend on the amount that has to be removed, the surface it’s on, the company you hire and your geographical region. To hire a professional service to clean up graffiti, it is going to cost anywhere from $1 to $3.50 per square foot. On top of this, plan on paying a $50 to $200 minimum service charge as well to get the trucks to your location. If you want to get a quote for your particular job, consider using HomeAdvisor.com for free. Here, you can explain your job and licensed contractors in your area will contact you with estimates. The estimates mentioned above should include the removal of the graffiti and the repurchase of damaged signs and/or property if necessary. If you want to do the job on your own, it is going to cost an average of $0.02 to as much as $0.30 per square foot by the time you factor in the chemicals. Generally, the only way to get rid of graffiti is to paint over it, and this price will greatly depend on how many coats of paints will be needed. For example, the KRUD KUTTER GR32 retails for $5+. Members on TheGrimeScene.com talked about what they should charge for removal. According to most of the responses by contractors, they said the quotes should be in the $1 to $3.50 per square foot. 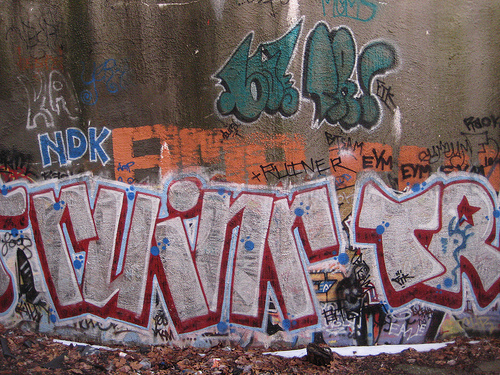 Graffitihurts.org suggested different methods to get rid of graffiti if you do it yourself. A paint out, for example, could cost $0.06 per square foot could cost $0.06 per square foot, whereas a sacrificial coating, a detachable protective film that effectively blocks vandalism inks, dyes, and resins from penetrating into the surface, could cost $0.02 to $0.06 per square foot. A non-sacrificial coating, a chemical resistant paint that allows solvent blends to soften vandalism inks, paints, and dyes, would be much more, averaging $0.25 to $1.25 per square foot. Lastly, an aliphatic-polyurethane could cost $0.25 to $0.50 per square foot. If the graffiti is hard to access, a surcharge may be applied, depending on the company policy. Since some of the graffiti removers involve the use of harmful chemicals, protective gear is highly recommended for those who are doing it on their own. If the company has to drive outside of its radius, a mileage surcharge may apply. Consider an environmentally sustainable removal agent to get rid of the graffiti. Its cost is just comparable to a chemical or a paint over. If you plan on painting over the graffiti, see you have any spare paint around. The job isn’t as hard as you think. All you will need will be a pressure washer and sandblaster, two items that can be rented at a local hardware store such as Home Depot.